Happy Easter to you all! With great joy and hope I wish each one of you, a happy Easter! Easter celebrates the rising of Jesus from darkness of death into dawn of hope through resurrection. Pharisees and the oppression of the Roman Power. His message of love was a taboo for the Religious and political elites. Our struggle has always been between death and life. Jesus was condemned to death and murdered as a criminal because, for people he blasphemed God. With his death, darkness seemed to engulfed his disciples and chose to flee from the scene. Hope of a new world seemed to have been strangled on the cross. It was the longest night of despair. But Resurrection turned that despair into a celebration of hope. Christianity was born on that morning with the message of love and hope. The simple fishermen were empowered through the Spirit to start a new worldwide wave of love that culminated in establishing the Christian Church. Christ rose from the dead on the third day as he promised. Human history changed that day. Hope is the secret of that wonder. We celebrate that hope that heals and empowers us. And our world needs a lot of hope. This world waits for the miracle of Hope. On the day of resurrection, the disciples and women went to the grave but found the stones removed from where Christ was buried. Easter is about removing the stones in our hearts and lives. Therefore, let the wonder of Easter, touch every human soul in this world so as to bring healing, peace and reconciliation. This is the prophetic mission of the church in today’s world. We celebrate life today in this Easter! Come let us together join the march to roll out the stones that have entrapped people in man-made graves. Let Peace break forth in the dawn. Let our society and the world be raised from hopelessness into Peace and prosperity and become the Promise Land. “sons and daughters of God. With the help of the Holy Spirit, we constantly strive to be peacemakers in these troubled times in our society and the world. We remember the Peace Prayer of St.Francis of Assisi, and with that we strive to bring love where there is hatred, pardon where there is injury, faith where there is doubt, hope where there’s despair, light where there is darkness, and joy where there ls sadness. When we were baptized one of our mission and calling is to promote love, peace and cooperation. 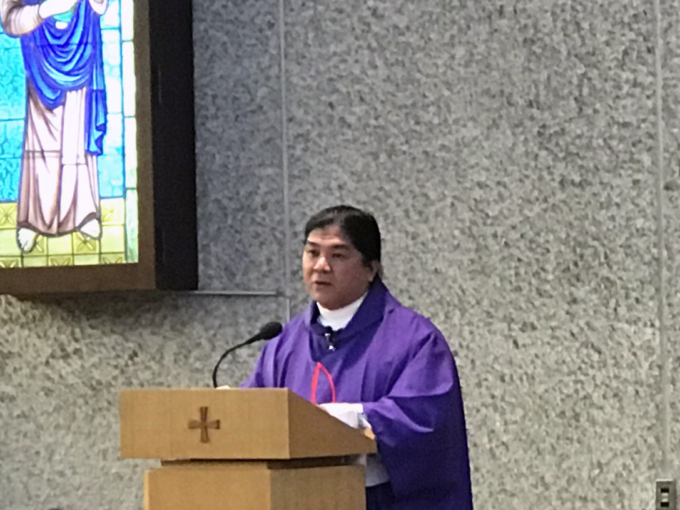 In these times of environmental disasters like flash flooding and heat-wave in Japan, when there is hatred, war and violence around the world,when there is murder in daily occurrence in our streets, when people have gotten so used to exchanging insults and hurting words in the social media, the Church admonishes us to help people in needヽand admonish us to remain steadfast in our common vocation and mission to actively work for peace and cooperation. assured us of his abiding presence and his peace. On August 15, 2018 on the feast of the Assumption of Our Lady, let us join together in prayer and fasting to ask God in his mercy, to give us the grace of Peace in our World and environmental protection from natural calamities. On this day also let us commend Japan, the Philippines, and the whole world to the maternal care of Mary, the woman to whom Jesus entrusted his “Beloved Disciple” and said, “Behold your son!” (John 19:26) We, for Our part, behold her – our mother in faith ― with filial love. “Mary, mother of the Church, be near to us especially when we tend to despair and run out of the wine of faith, hope and charity.” (John 2:1-11) Teach us to do only what your Son asks of use And when we lose heart in the face of environmental destruction and persecution, may we stand by you at the foot of the cross and regain our strength from the blood and water that flowed from the wounded side of your Beloved Son, our Lord and Savior, Jesus Christ. The Lord is Risen, Alleluia! The Resurrection of Jesus Christ is the most important truth in our Christian Proclamation. The effect of this is the foundation of the Church immediate Mission of Proclaiming the Gospel through the power of the Holy Spirit given to the Apostles. Without this Gospel Truth there would be no Christian Faith. We are told in the gospel that Jesus predicted his predicament that he will suffer, die and after three days, he will come back to life. Often as we think about the sacrifice of Jesus, we tend to focus on the unbearable physical pain He endured. We have read in the gospel that He was flogged to death, and had a crown of thorns driven into His scalp. He was made to carry His own cross. Nails were punched through His hands and feet before He was hoisted into the air on the cross. The most inhumane and cruel forms of capital punishment ever devised. It’s hard not to focus on the pain He endured for us. But, as we look at this Easter, let us consider another way of looking at it. Jesus Was made to suffer in the moments before His crucifixion. Let us consider the emotional pain Jesus endured as his closest friends turned their backs and betrayed him. Jesus personally chose 12 disciples whom He poured himself into. These men were almost His earthly family, surrounding Him, learning from Him, and serving in His ministry. They were Jesus’ “inner circle.” Jesus loved them, and yet He knew ― long before that some of these men would publicly betray Him. Judas Would sold him for 30 pieces of silver. Then Peter would deny him ― which, according to Mark, Jesus foretold prior to leaving for Gethsemane ― must have stung deeply. As Jesus was being beaten and ridiculed (Mark 14:65), Peter was busy distancing himself from Christ (Mark 14:66-72). Three times people approached Peter to ask him if he was associated with Jesus, and three times Peter denied Him, ‘I do not know this man of whom you speak.’ ” (Mark 14:71, ESV). At a time when Jesus was being accused and beaten, His friends turned their backs on Him. What emotional pain this must have caused, even as Jesus knew it was coming and understood that it had to be! Maybe we are feeling this, and it sounds familiar. Maybe we have friends or family members who have turned their backs on us, or perhaps ― like Judas ― they were instrumental in causing the suffering we are now enduring. Maybe we are struggling through pain and despair, and the people we thought we could depend on, have disappeared. Maybe we have been hurt by others in the church. Bodily pain hurts physically, but emotional pain slices directly to your soul. In our lives sometimes, people will let us down. People will turn their backs on us and cause us pain. But here s the key ― Jesus was forsaken, betrayed and crucified, but He conquered all of that! People are imperfect, but Christ is risen and will not let you down! The Gospel tells us not to put our faith into men or princes. Instead, in this Easter let us place our eternity in Jesus Christ, the Resurrected One, who endured scorn, pain, and betrayal by His friends, so that we may have a hope that extends far beyond the pitfalls and pains of this world. Jesus Christ has conquered sin and death. In this Easter, let us rejoice and be glad for God the Father, has not abandoned us but instead has given us this Jesus the resurrected One to be in our hearts and in our homes. Again, Happy Easter to All!!! Congratulations to each one of us as we celebrate the gift of the New Year. After giving us his Son our Lord Jesus Christ,on Christmas day, God has given us another gift of the New Year. For some of you the year that ends has been a year of triumph,success,progress in life and we rejoice with you and we thank God.However for most of us,it has been a combination of joy and sadness,ups and downs,triumph,and failure and as we reflect on the joys and pains,we turn to God for comfort,consolation,strength,thanksgiving and guidance. We continue to celebrate Christmas as,God’s decisive intervention in our life. The words of prophet lsaiah 9:2 should accompany us during the New Year. Let us strive to welcome Christ,the light of the world in our lives.Thanks be to God,our parish has continued to flourish with Jesus Christ and the Holy Spirit touching many lives. 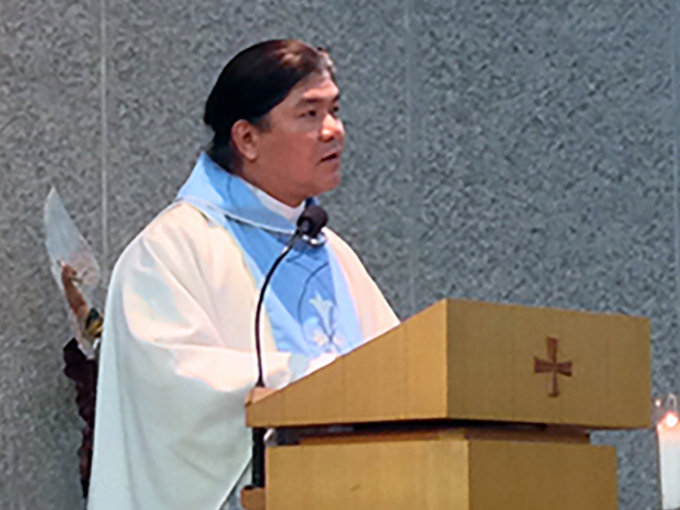 We would like to thank everyone for participation and contribution in making Matsudo Catholic church a welcoming and beautiful parish. 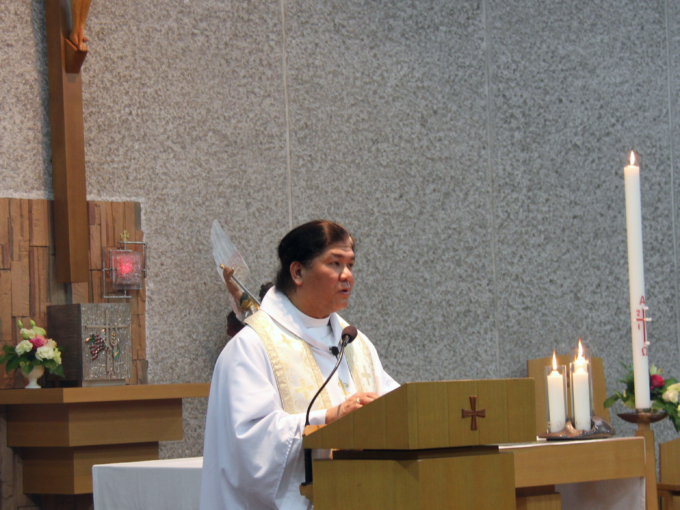 We thank you for the financial,spiritual,and moral support that you have given to the parish. May the good Lord continue to reward you.We thank God for the Group Study (Benkyou-Kai), baptisms,First Holy Communions, Confirmations, Holy Matrimonies celebrated in our parish during the year that ends. This is a sure sign that Jesus is risen and has found a home at Matsudo Catholic Church here in Chiba Ken. The Holy Father,Pope Francis has a beautiful gift for Japan,commissioning two bishops,one for the Archdiocese of Tokyo and another one for the Diocese of Naha of Okinawa before the year ends of 2017.We thank God for all that has been done to renew and strengthen the Church of Japan. During the coming year, we shall continue to strengthen our faith so that the heavenly Father may be praised because of our good deeds inspired by the Holy Spirit. I am sure that Clod has prepared all the help we need to make 2018 a good year for all of us. Let us work hard doing the right things everyday and let us not waste even a single day in helping in the New Evangelization of the Church. May we all have a good year so that at the end we can come to God with hands full. May the Lord bless you and protect you. May the Lord smile on you and be gracious to you. May the Lord show you his favor and give you his peace.Amen.